We’re really not turning 70, are we? Certainly not. We’re only 18 (with 52 years of experience). 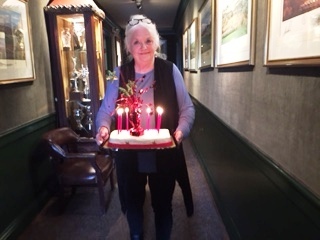 Our classmate, Ruthie, ushers in the new decade with a cake for all 15 of us. 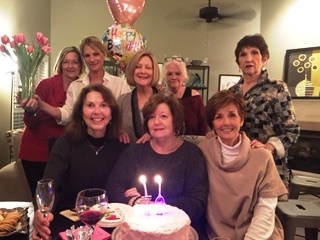 The girls of the West Point High School of ’65 (at least the ones close or determined enough to come) celebrated their entry into another decade last week. I would have posted sooner, but its taken me this long to recover. I couldn’t help but recall our 16th birthday party when our parents got together to throw us a big dance at the Henry Clay Hotel – in the Safari Room. We danced the nite away under the watchful eyes of our folks. At the 70th party we danced again and got a little wild since our parents are no longer around to keep us in line. With no rules or expectations, I’m betting this could be one fabulous year. My girls have a love/hate relationship with getting older. The flipside of younger is not half bad as long as we have good folks to do it with. We do. Old age isn’t something one gets to practice and this is the first time we’ve been this old so a little practicing has begun. 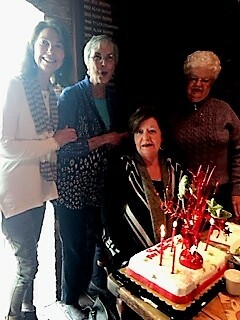 Among our girls reaching the milestone year in January were from left Betty Lynn Webber Cameron, Ann Edwards Gatlin, Norma Clark Atkins, and Sandra Jennings Boykin. Okay girls, we’re looking up to you, our elders, for direction as we work on getting this aging thing perfected. This entry was posted in Boomerang & the old gang and tagged Aging creativly, Turnnig 70 with style by Emily Jones. Bookmark the permalink. Happy Birthday to all! You are still just babies! 70 is the new 50 right? That is my story and I am sticking to it! You girls are starting the year off in style. 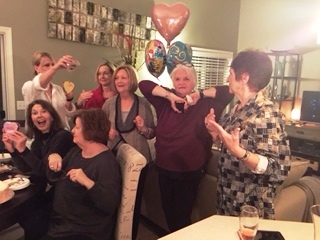 Happy Birthday to the ladies of class of 1965. Everyone looks wonderful, I hit it last November. Can’t tell any difference!!! Laughter may come easier, or not. But it is always good for the soul. How is your Daddy and please don’t tell me he is at home free of all aches and pains..No today. I don’t think I could stand to hear that. I just love reading about your escapades with the class of 65! We are celebrating Bill’s aka William in West Point 70th next week with a trip to Dallas and Waco! Love being around y’all on those reunion weekends and thanks so much for welcoming me with open arms!!! All you guys are so much younger than I am. I still remember Olivia riding on my shoulders. I must have been about 13 and she was 5 or so….SO in my memory we are all 5 and 13…..Memories make my body fun to live in ? Please note my girls and I are NOT 70 and never will be. We are 18 with 52 years of fabulous experiences.